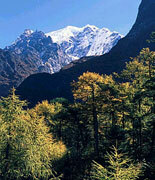 Trekking in Nepal Himalaya attracts several thousand international trekkers each year. With world's eight out of ten highest mountains in its territory, Nepal boasts some of the finest trekking trails anywhere on the earth. Our treks range from the classic hikes to Everest and Annapurna base camps or the exotic Mustang , Dolpo and Manaslu treks to the soft hikes suitable for family adventure . You can even combine your Nepal trek with sightseeing tour of Nepal's fascinating medieval capital , a thrilling rafting trip or an elephant back safari at Chitwan national park . If you have just a short time available for a Nepal trek or if you are in a look for a short walking experience in the Himalayas, the followings could be the treks for you. We are offering below the five best trekking tours in Nepal . If you are trekking in Nepal for the first time, these could be the right trips to start with . However, those of you who are not a serious trekker but want a soft hiking combined with other activities may like to go for nature and culture tours as listed on the left of this page . Tailor made trips : All our tours are tailor made private tours. We are happy to customize any of our Nepal trekking packages to your specific requirements or combine them with any other activities to create an unique itinerary designed specially for you.